You work hard at making your quarter scale projects beautiful, so why are you using paper floors, quilling paper baseboards and no crown moldings?? 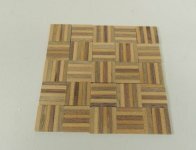 Now you can have all those and more in beautiful hardwoods manufactured specifically for the small scaler! A select few items for half scale too!